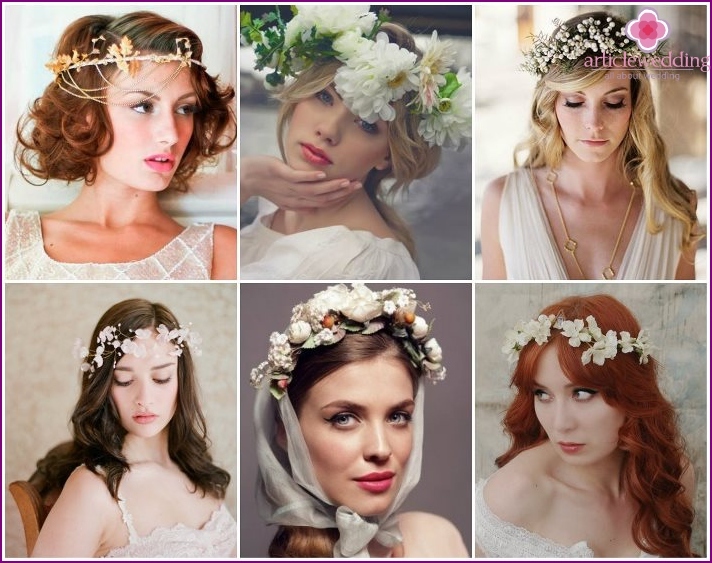 Since ancient times, the bride's head decorated by differentaccessories. Wedding Wreath - an ancient decoration of the bride, which is always in fashion. It is designed for gentle brides-dreamer. Wreath is used as an attribute for a festive hairstyle and at the same time as the hardware for the wedding veils or completely replaces it. This is an important accessory, which together with the ring, the dress, creating a charming, unique image of the bride. In the old crown decorated head of each bride. It was a sign of the girl's beauty and chastity, he was allowed to wear only a blameless girl, and after marrying the crown were allowed to water as a symbol of leaving innocence. In the old days, wreaths adorned with wildflowers, leaves spikelets of wheat. 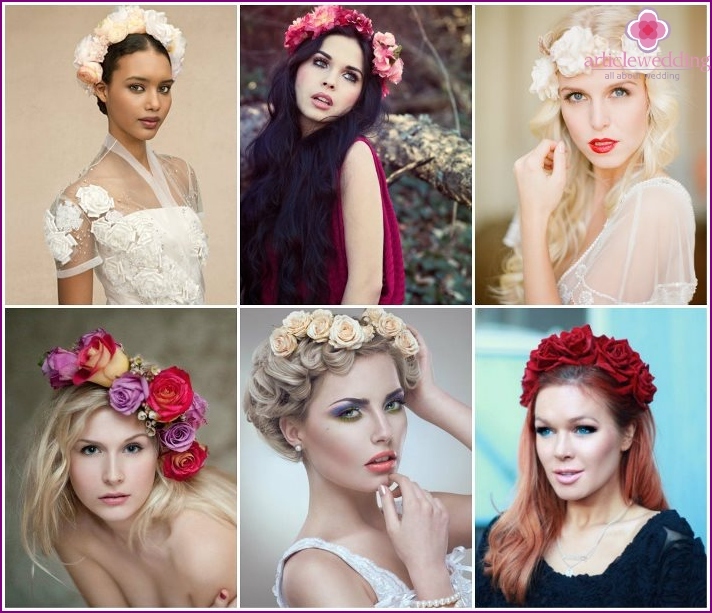 Now the golden hands of professionals carved wreaths of fresh flowers or decorative, delicate lace, satin ribbons, crystals, beads, beads, rhinestones, feathers light. Spray rose. The ancient Greeks, a very revered the flower and its petals showered bed Suite, rosebuds were used to create wreaths and hair. 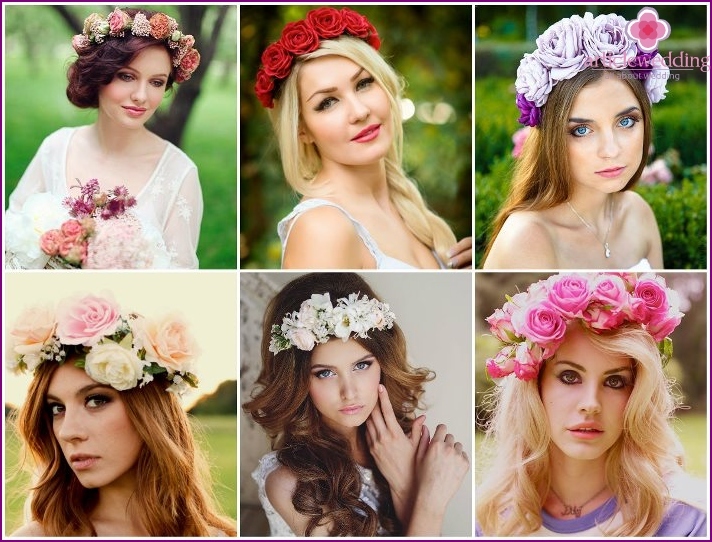 Headgear, in which woven shrub roses, will be suitable for most low girls. The height of the decorations reaches 10-15 cm, which visually lengthens the growth of a miniature bride. Spirea. Using a long, flexible twigs of this plant thickly strewn with tiny white flowers, it is easy to make an original wreath. It is necessary to roll only one escape in the form of a hoop. Composition with tiny flowers and berries. Hair Ornament viburnum, barberry, mountain ash or other colorful fruits and small flowers - custom originating even from the ancient Slavic peoples. The combination of bright red berries branches and small flowers adds a special touch image of the bride. Wildflowers. Volume wreath of daisies, rue, mint, ears emphasize the gentle image of the bride. Verdure. Wreath with this flower symbolizes purity, tenderness. The plant is very resistant, hold in excellent form throughout the holiday. These flowers will suit a girl with a nice little sweet little face. The white baby's breath blossoms are small size, so well suited for complex venochnyh compositions. Alstroemeria. This flower will give the image of a bride finesse, elegance. In the fashion world with an artificial wreath decorationIt is gaining more and more popularity. It looks original, almost indistinguishable from the living wreath with flowers, put it after the wedding. This hair ornament is made in the form of the crown of the entire hairstyle or a few large flowers. 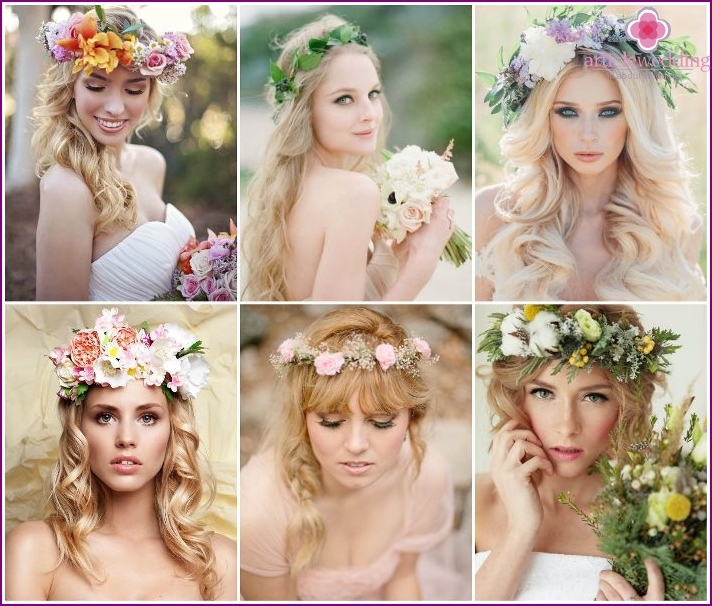 The trend wreaths of light, pastel colors. Decorative buds come in various sizes and shapes. You can play interesting and colors of artificial materials - choose the decoration under the shade of a wedding dress or make bright contrasting accent. 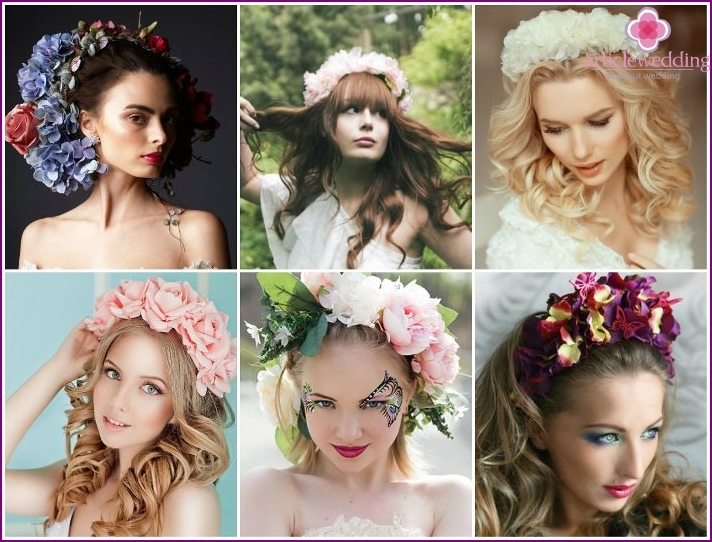 Wreaths hair with feathers are able to createseveral images: refined and delicate, shocking and audacious, grandiose and humble. With such an extraordinary and bold accessory you are sure to attract the attention of visitors. It is luxurious, comfortable, beautiful. Wreath with feathers, complete tune with the style of jewelry or flowers help to make the culmination of the image of the bride and gave him a twist. 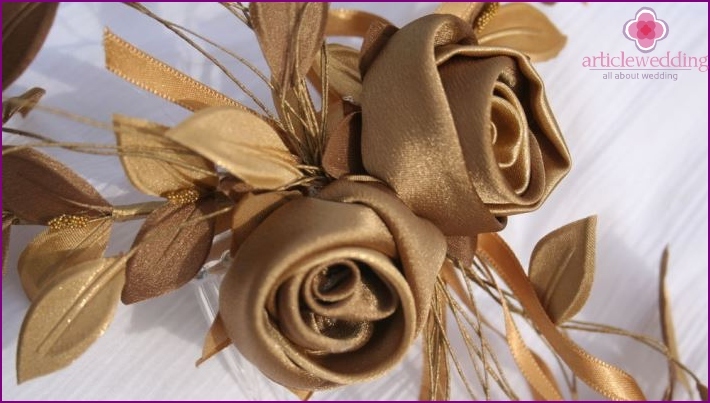 Very refined and aristocratic look wreathswith satin ribbons, colors corresponding to the tone of the bride dresses. Ribbon for the wreath used and as a basis and as an element of decor with flowers or other decorations. Using it, you can tinkering flowers, bows. To create such an accessory use the narrow and broad, dense and average density tape. 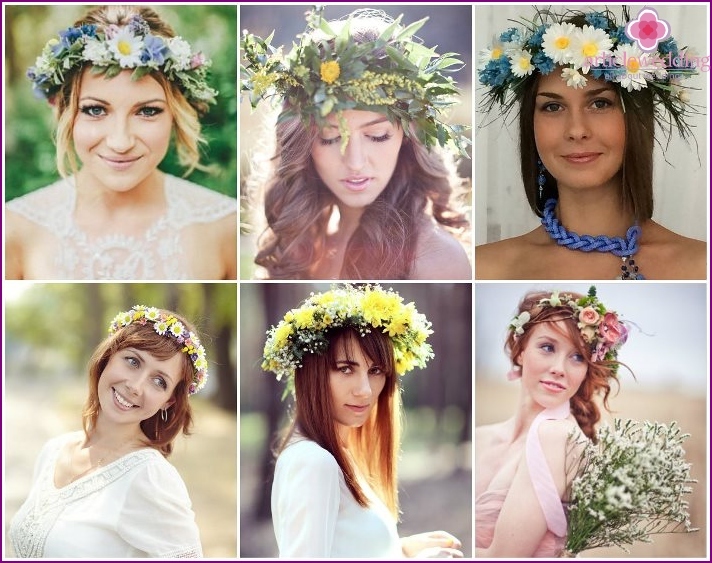 National wedding dresses are famous Ukrainiansworldwide embroidered ornaments and flowers. 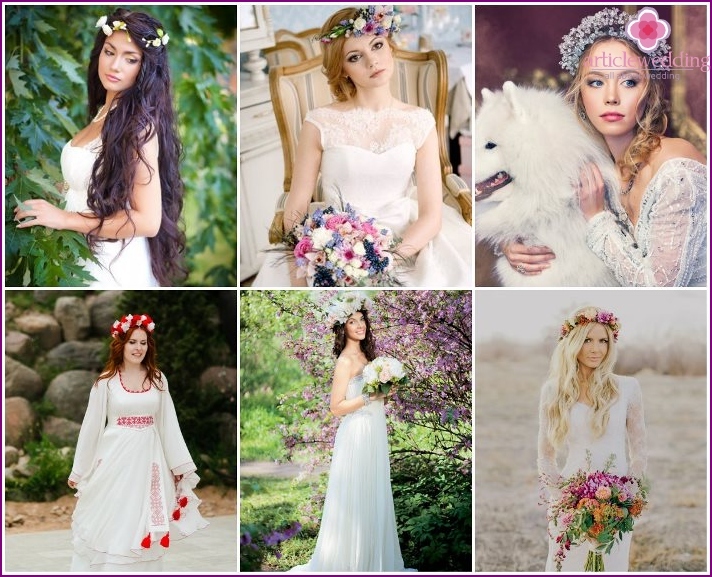 Ukrainians Wedding dresses are striking in their beauty, and the bride's head covers no less chic Ukrainian bridal wreath with live wild flowers and ribbons. Traditionally, the crown is considered an important symbol of the Ukrainian people. There is even a special list of elements which have to be in the product. First knit a light brown band in the middle - as a symbol of the earth. On each side of one tie brown yellow ribbon, which means the sun. Further on both sides knit green ribbon symbolizing youth, beauty. Then the blue - a sign of sky and water. They were purple - a sign of wisdom. The following crimson mean honesty. The latter is added pink ribbons - being. The crown of the place for the wedding lush usedstylish tiara, made with the addition of accessories in the form of natural stones, crystals, beads, sequins. The wreath, inlaid stones, crystals will be an ideal decoration for the bride who wants to feel like a princess. Equally stylish looks this attribute, if it is decorated with beads. 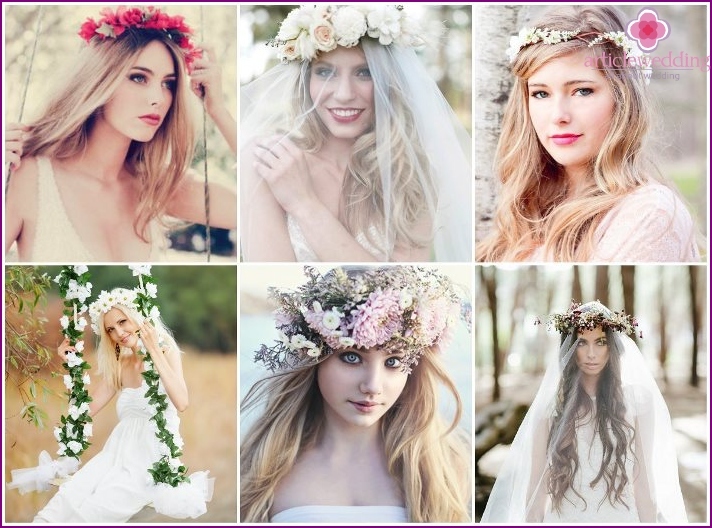 Crown for decorating hair, as well as other wedding accessories, selected based on the style of the bride dresses. Classical. The crown in the aristocratic style will suit the bride who prefers a conservative marriage, without excessive decoration and innovation, but with elaborate minutiae. The image of the young with a wreath in this style - charming and sophisticated. To decorate the suit carnation, hypericum berries, baby's breath, ranunkulyus. Kartri. For such a marriage would be relevant to the wreath with flowers of lemon, peach and orange tones. Its decor appropriate to add ripe spikelets of wheat or rye. Rustic. Wedding in such style is characterized by simplicity and restraint, but because of the wreath is best used ruskus, succulents, Limonium or tanacetum. Boho. For forest wedding ceremony will be the ideal solution volume crowns bright burgundy color and light, airy dress like a fairy fairy. The decor of such wreaths made use rosebuds, peonies, wild flowers, leaves. Chebbi-chic. Velvet and delicate peonies is best suited for the bride, choose this elegant direction. Wedding in color. It is fashionable to choose ceremony, stylized in a certain range of colors: red, blue, light blue, white. A perfect complement to this celebration will be the crown of flowers or ornaments, which will correspond to the topics of the ceremony. The Greek style. Bride on a wedding as hair ornaments suit crowns with laurel leaf, real or artificial flowers, gold rim. Wreaths in the Greek style, decorated with sequins, beads and beads. Pick up her dress to the lush wreath with large buds. To direct a narrow fit alongside more modest small-sized florets. In combination with the dress of "Empire" or "A-line" will look great miniature wreath with small flowers or a large bud. Long curls. 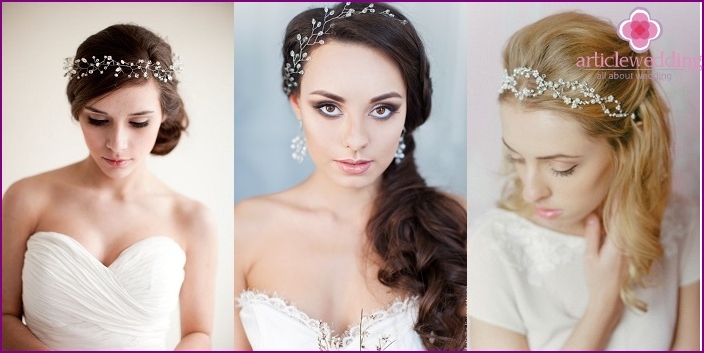 Suitable decoration for this hairstyle - volume or the lush bridal wreath. To create a romantic image of him wearing a veil over. 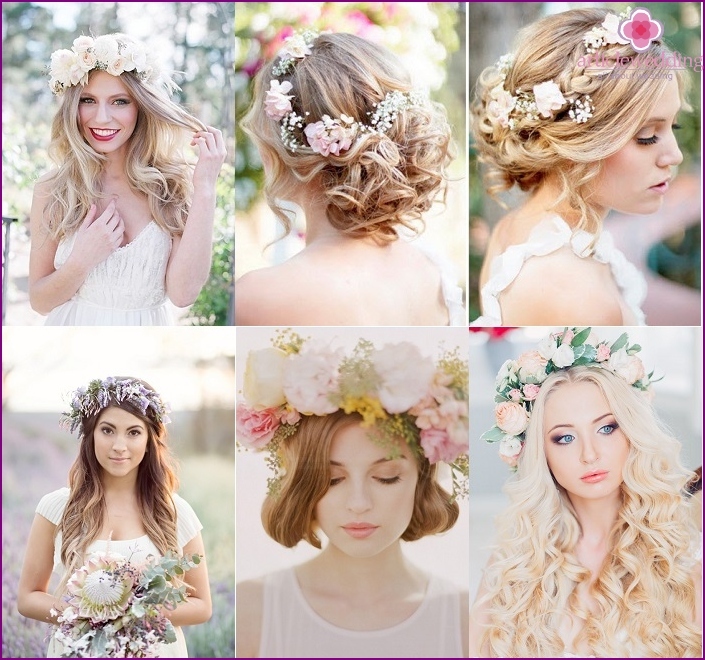 Owners of the long hair do not wear small wreaths, flower buds should be of medium or large size. Hairstyle in the Greek style or hair collected beam. In this case, pick up not too volumetric decoration or in lieu of flowers on the wreath using rhinestones, beads. Long flowing hair with braids. 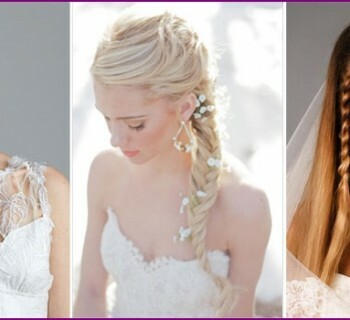 In this hairstyle live flowers woven into the braid and create a crown. Short hair. Suitably to this hairstyle would decoration of several flowers and lace ribbon with a small flower bud on its side. Medium length hair. There will be more suitable composition with gentle middle-sized buds. The huge popularity acquire wreaths,decorated with fresh flowers. Manual work is very much appreciated. 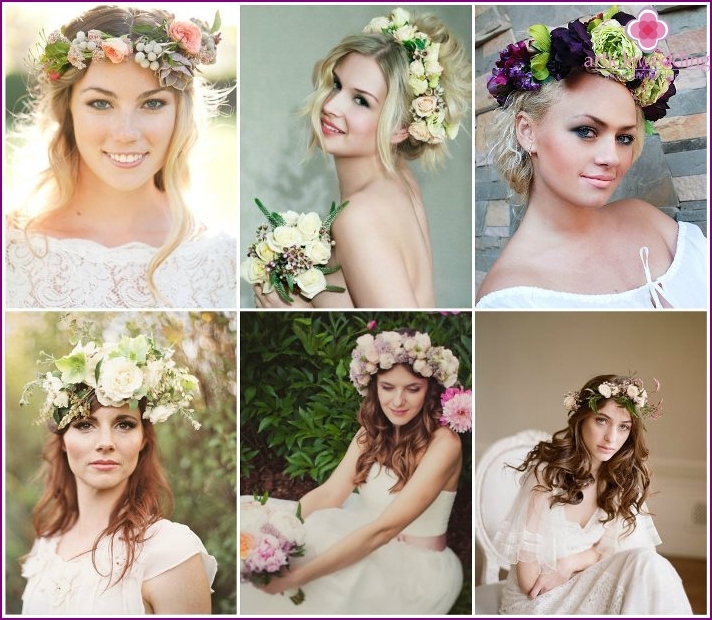 If you want to impress the invited guests an original floral bridal wreath, watch the video master class below. Using this example, you will learn how to easily create beautiful wedding decorations without any cash outlay. Stylish beautiful wreath - an essential accessoryWedding image of the modern bride. It symbolizes infinity, purity, chastity, and woven into the product flowers and other decorative components can tell about the feelings that the couple feed each other. A variety of jewelry is amazing. They look very harmonious ensemble with a wedding dress, creating a uniform style of the bride. Now it is not only the traditional attribute, but also a fashion accessory that looks at the pompous wedding photo collages.